These two brave robbers want to rob a bank. You must help them in this uneasy business. 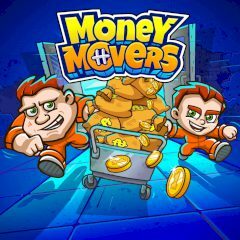 Collect all money packs in all levels and come to the exit. Remember that both of the robbers must escape, otherwise the exit will not open! These robbers are going to rob a bank tonight and need your help. Control the robbers through the mazes of the bank, collect all money packs on your way and have great fun with this funny arcade game. You will be able to test all your skills here: your bravery, your attention, your gumption and logical thinking. Are you ready for a night adventure in this wonderful free adventure game which will not surely leave any true gamer indifferent?